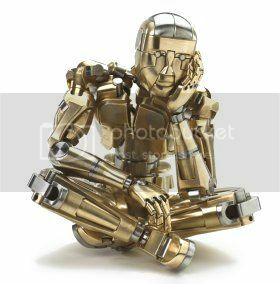 You Are Here > Forums › Advaita Vedanta › Are we conscious robots? If you carefully observe your actions you will never know why you choose to behave so. You behave so because, you behave so. Whether you like it or not you behave so. Some of your behaviors you may like. But still, when you ask yourself, why you choose to like them, the answer is, simply, you like them. You dislike something because you simply dislike them. You may attribute some humbug reasons. If you dig out further, there will be never ending reasons down the line. Actions are inevitable. You can not refrain from acting. You are hard wired to act. Here, I include thinking also as a form of action, mental action. Actions simply happen through you. This is simply weird. Are we conscious robots? Dear gachchy, I hope you come back to this forum, I miss you. Thanks gachchy, for popping by again. I read the links with much interest, and tend to agree with the ideas put forward. Our actions only appear to be our own, but they are not at an individual unique sense, rather, they are a product of total predictability based on what appeared prior to the eventual situation. I think that’s what Morsella meant by consciousness playing a passive role in life – we are in essence only repeating what has already happened infinite times over, so not much power here. That every eventuality is caused by a causeless cause is the only true power. looks like a lot of work went into this website/forum, but it unfortunately never took off the way it seems it should have. this is probably because so few know what metaphysics really is, as opposed to the stories of the paranormal…although many being true, are a waste of time dealing with. pls note: i had the top rated site in keywords metaphysics and advaita vedanta in google, and 11th rated in quantum theory from 1999 to 2002.. it was either taken down by the US govt or possibly freemasons for perhaps revealing too much too clearly and, by so doing, marginalizing their power facade. i was also elected chief moderator in a forum of then 3,200 in yahoo groups called advaitin from 1996 to 2003, when i left since i couldnt keep up because of a bad back. anyone here is invited to join and participate in (to teach and learn) my FB page THE AGELESS WISDOM TEACHINGS (aka perennial philosophy)..
btw, i think FB is better because a lot of people will already be signed in, so more likely to participate.. Thanks for your participation mirrorONE – hope you have more to share here @ SpiritAwake. I looked on Facebook but couldn’t find anything.. could you provide a valid link? yes, as i alluded to, i believe we’re pretty much on the same page of metaphysical insight. would love some participation on the FB page. i havent done much to attract anyone there, at least not as yet. also, i was particularly impressed with the fact that you’re into advaita *and* castaneda’s work (i’m convinced the latter are genuine teachings of the toltecs)..
if SpiritAwake starts gettin busy, that would be great too. i’m just interested in sharing with people who are into this stuff and have remained openminded with their take on it. Thanks mirrorONE for the link to your FB page. I see it now and will read through your material with great interest.